It’s hard to imagine a serious endeavor that is not taken on by a team. Every person that does something special and ‘solo’ is the first to recognize the team behind them. The entrepreneurial celebrities of our times—Steve Jobs, Mark Zuckerberg, Elon Musk, Oprah, Richard Branson, Bill Gates, Jeff Bezos, Lucy Peng, John Mackey, Anita Roddick, Herb Kelleher, Diane von Furstenberg, Muhammad Yunus, Howard Schultz, Arianna Huffington, Larry Page, Sergey Brin, Fred Smith—all acknowledge their greatest achievement as being the team they put in place to realize their dreams. Good teams don’t happen by accident. There are a series of decisions to be made, on the team’s makeup, it’s culture, and the way it makes decisions and gets things done. High performing teams have to have a good leader, but equally they have to have good followers, sharing the same purpose and vision, and able to step into the leader’s shoes at any point, which at some point they will. Teams are those groups of around five to twelve people who share a common mission. They are big enough to have the skills and diversity the mission needs, and small enough for each team member to know and rely on each other, and to care about each other. Selection, training, and shared experience allow team members to appreciate the culture, standards, and processes that enable the team to work. They are different people, with different personalities, perspectives, and life values, but what they do share is a common purpose, a desire to achieve that purpose, and mutual trust. What’s important for now is that almost any group of people can become a high performing team—with the right tools, techniques and commitment. It’s about creating a common purpose, about creating desire and confidence, about creating trust. It’s about your role in that team—be it as a clear team leader or as an essential follower—in creating a team that performs its mission, consistently and reliably, every time. That’s a challenge. There are many components to a team, and many things that can go wrong. We’ve cut the idea of a high performing team a million times over from every which way we can, and it boils down to these three things: the team’s mindset, its skillset, and the processes that bring those two together. When you define these three things, you define your team. 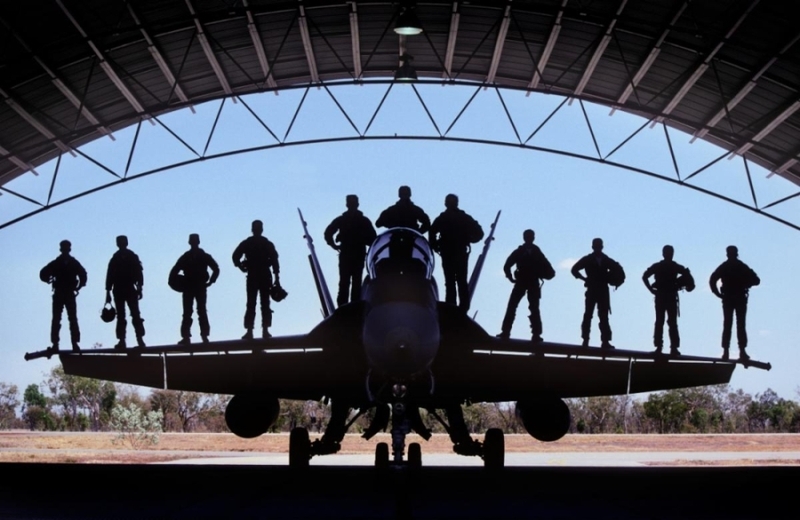 Fighter pilots are some of the most efficient operators on Earth, and all operate in teams. However, what’s interesting is that the majority of fighter pilots are average individuals. Very rarely will you find elite athletes, academic genius or groundbreaking theorists amongst trainee fighter pilots. However something very special happens once these average Joes walk through the door to pilot training. From day 1, they are taught a unique operating system that transforms groups of everyday people into elite and high performing teams. This system is what we call the Flex Methodology – a simple, repeatable and effective tool that delivers some extremely useful outcomes. The good news is: this process has a universal application which means it can be used by anyone, and applied to any group of people. My team and I understand the processes that build high-performing teams. And we have built one of the most impactful, engaging, and memorable team transformation programs in the world using the inspiration and experience of elite military teams. Contact us today to discuss taking your team to the next level!